Why are striped spaces important? When you get a BraunAbility accessible vehicle, you buy your freedom to go anywhere you want when you want. Being able to drive to the store for a forgotten recipe item is no longer a fantasy. You can park and independently go to the store on your own! But when someone parks in the striped spaces next to handicap parking spaces, not only can you not deploy your ramp to re-enter the vehicle, you are stuck waiting for the offender to return and move their vehicle. We won't stand for it! BraunAbility vehicles bring independence to tens of thousands of people every year, and every year their independence is taken away over and over again by people who don't understand the basics of parking near a handicap van. BraunAbility conducted a survey to see just what the general population knew about striped spaces. The results supported our hypothesis: most people simply aren't aware of what striped spaces are for - even people with accessible parking tags were unaware. 74% of people have personally seen a handicap parking space being improperly used. 57% of respondents didn't know what the striped spaces indicated. 15% of respondents didn't know striped spaces meant anything at all. What about invisible disabilities? Is Save My Spot for me too? A quick 411 on Invisible Disabilities: these are physical, mental, or neurological conditions that may affect an individual's movements or senses that aren't apparent to others (hence the term "invisible"). These can be conditions like chronic fatigue syndrome, asthma, epilepsy, multiple sclerosis, etc. People with these invisible disabilities qualify for handicap space tags and often well-meaning onlookers may shame these individuals who are mistaken for handicap parking space abusers. However, Save My Spot is concerned with protecting the striped spaces located next to some handicap parking spaces usually marked with a "van parking" sign. 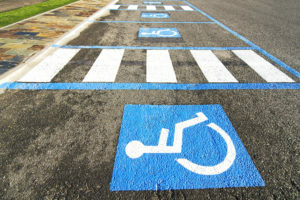 If you have an invisible disability, you likely are not in need of these accessible vehicle parking spaces because you likely aren't using a mobility aid like a wheelchair or scooter. These striped spaces were specially created to allow people with these aids to safely enter and exit their side-entry vehicles away from the traffic of the parking lot. The back passenger door opens and a ramp extends into the striped space. Without these spaces, wheelchair and scooter users are left stranded. So while Save My Spot isn't specifically just for accessible parking, you can certainly use Save My Spot to help educate your communities about the importance of respecting handicap parking spaces. Save My Spot launches again in May 2018 to inspire a new wave of advocates and further our goal of protecting striped accessible entry and exit areas. Keep your eye out for updates as we grow this campaign throughout the month. In late May, every BraunAbility dealership location will receive free Save My Spot kits that contain the very popular parking "tickets" explaining an abuser's infraction, a sticker for your vehicle door explaining the extra space needed for a ramp to deploy, and other BraunAbility gear. You'll want to get your hands on one quickly though: supplies are limited and demand is already high. Follow our Facebook page to be the first to know about Save My Spot kit availability and share this blog on your social media pages to keep the conversation going!